I finished my first Lotoja 204 mile race (Logan UT to Jackson WY) as a 2 man relay team with my brother. He assigned me the two back to back sections where there was all the climbing. This event is very different than the many double centuries I rode in California or the 500 mile relays I rode for Furnace Creek 508 or Hoodoo 500. Unlike all those, this had the feel of a real race and by far the most professionally put on event I have ever ridden in. You can ride it solo, which I think most do, or as a relay team. My brother and I entered in the USA Cycling sanctioned race category but they do have a citizen class category also. I saw neutral support vehicles often, following the fast packs and several officials on motorcycles monitoring you. They had well marked feed zones and relay transition zones. There were also neutral feed zones where you would take on a new water bottle or some gel on the fly from volunteers so need to stop. Also no need for any route sheet since every turn had volunteers flagging you where to go. The finish line was like being at a pro cycling event with barricades and a big screen leader-board. Riders names were called out as they came across the finish line. Overall it was quite an amazing experience. I understand now why this event is hard to go into. We were lucky to have Anne and Deanna crew for us and they did a great job. 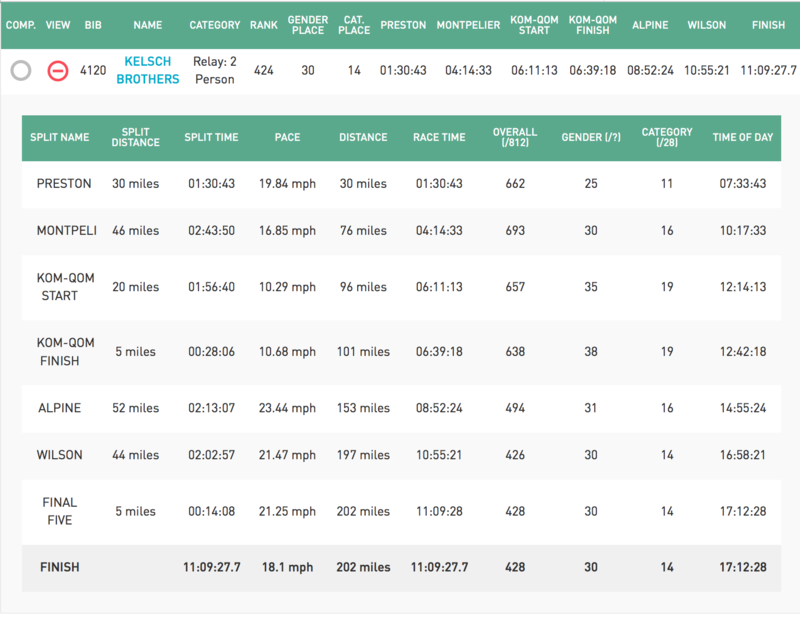 We ended up finishing a bit over our goal of 11 hours, 14th out of 28 in our category of 2 person relay team. 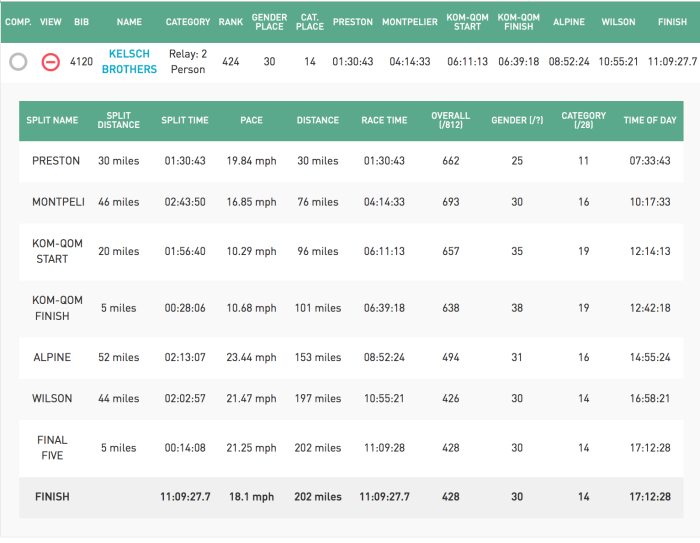 Since this category has no age divisions, we did reasonably well but I think much of that was due to my brother’s speed more than mine. I think I did reasonable well, but was a bit disappointed that I was not able to do my two sections faster. It was quite different for me to be climbing a hill and being passed by so many. Nevertheless, I had a goal of finishing in 6 hours and I barely met that goal unless you count the time when I stopped at the transition to change water bottles and take on food. When I look at my performance after the fact, I was near the limit, with an average heart rate of 150. I was able to average 15.6 mph over the 93 miles, that included nearly 6,000 feet of climbing. What hurt my time was that I had to ride most all of the miles solo. They started the race relay teams first, followed by the CAT 1 racers, then advanced to the slower riders in that order. So when I was riding I was either with Race Relay or Cat 1 or 2 riders. Most of the race relay riders were doing a 4 or 5 man relay so they could go all out on their own segment. The fast racers would come from behind me in a big back but their speed was way too fast for me to latch on, even for a short time. Although you are suppose to only draft behind the group you start with, many took advantage of anyone around, but in my case there was few around me to hang with. On the occasion when I was able to draft for awhile, it made a big difference, but I think I ended up riding 90% of the distance solo. Not having a big guy to follow down the hills really hurt my time since I don’t have enough weight and skill to descend fast by myself. I was trying to make sure I ate sufficiently and was often drinking, but I forgot to put electrolytes in my water bottle and ended up cramping about 20 miles from the end, on the steepest climb where I should have done my best. I fought with the cramping issues until I finished since I didn’t have the luxury of just stopping for awhile to recover. Although I did a lot of training for this, too much of the training was at a slower pace and there was not enough speed work, in my opinion. That speed base can take a few months to build up and I was trying to do it in a few weeks. Traveling to Italy for a bike tour was a contributor, although I did get a few days there where I was pushing the pace. Then I might just have to accept that I was slower than many others because I am getting too old. It is just not something I want to accept right now. 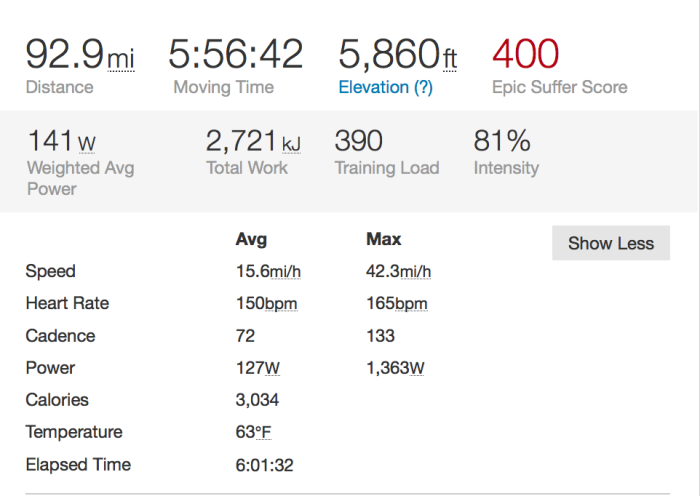 Here are the key stats from my ride. 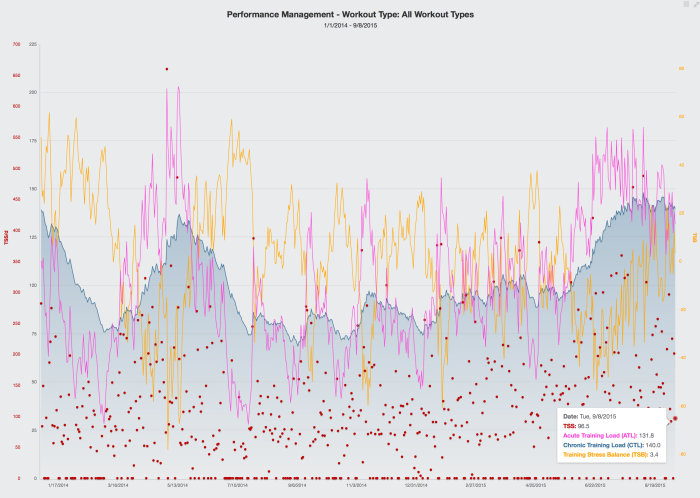 You can see the Strava Suffer Score was rather high, due to a high average heart rate. I guess I feel I put in my best effort on that day but I also feel that with that amount of effort in terms of heart rate should have yielded a bit higher power and my lack of fast twitch muscles, and therefore hard for me to jump on a passing pack, meant a slower overall pace that many riders who were doing the entire 204 miles. When I look at a 70 mile Strava segment that include the 3 climbs I did, it is even more apparent. 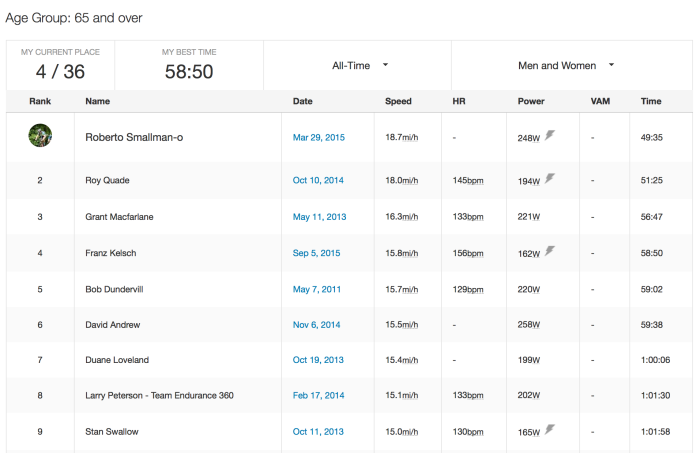 Here I was the slowest of four people I follow on Strava and among those 65+ I was only 4th out of 5. 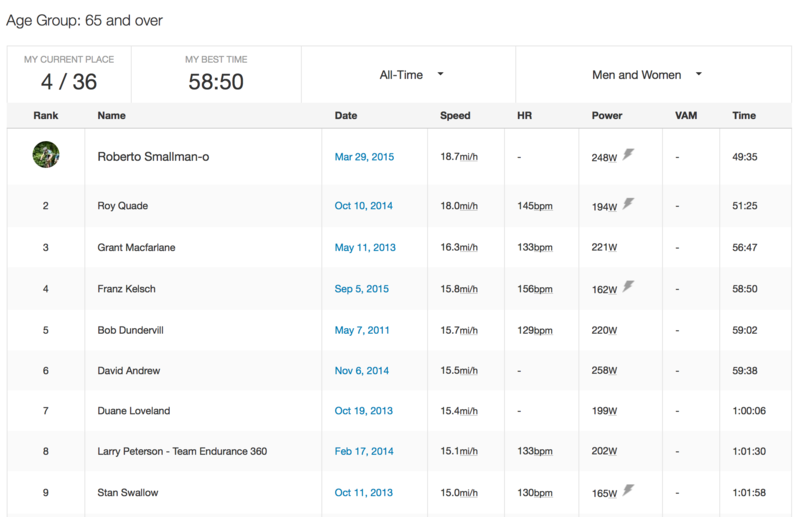 For the 65+ group on Strava I am use to being in the top few spots, not near the bottom. Next up is the Huntsmen World Senior Games. I hope to do a bit better there since two of the three events I entered don’t allow drafting (hill climb and time trial). I just wish I had a more optimistic view of how I was doing so I could do a better job of getting ready. I have limited time to train now so it is more an issue of not losing my fitness than improving it. Well all the training I can do for the Lotoja race is done. Is now past time for tapering and managing the balance between fitness and fatigue. 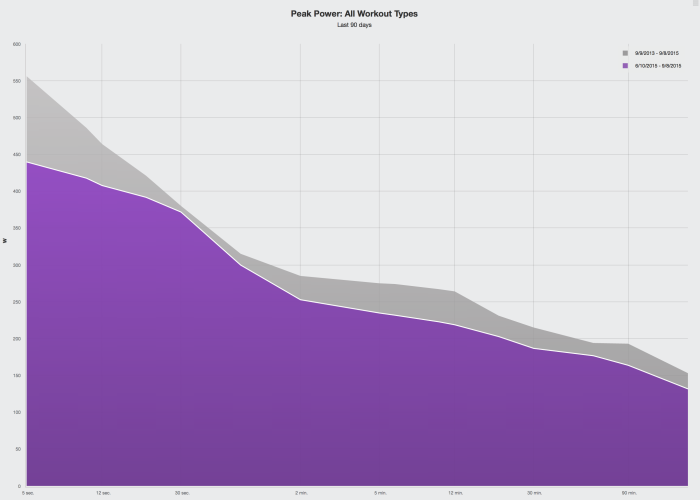 You can go by how you feel, or if you are like me and like to use data you can use a program like Training Peaks that will calculate your fitness, fatigue and form based on your past workouts. Strava also has a similar feature for premium members but I don’t find it quite as polished. Fitness and Fatigue are terms that most people understand. It is Form, or the balance of the two, that also needs to be considered. You might have great fitness but are in bad form due to a high level of fatigue and that would result in poorer performance than if you tapered more. Training Peaks uses the terms Chronic Training Level (CTL) as a measure of fitness, Acute Training Level (ATL) as a measure of fatigue, and Training Stress Balance (TSB) as a measure of the balance between the two, or sometimes refereed to as Form. I started my training in June and finally got theCTL (blue graph) up to 143, which put my fitness better than it has been since the beginning of 2014. During the build up, my fatigue as measured by ATL ( purple Line) got as high as 181, resulting in a Training Stress Balance (TSB) as low as a negative 53. With leveling off my training, including two weeks biking in Italy the last half of August, I have been able to keep my fitness nearly as high but have reduced my fatigue down to 131, resulting in a Training Stress balance now being positive. They recommend you peak your fitness two or three weeks before the race and then you get your TSB to slightly positive on race day. When you taper, you might lose some fitness but you lose fatigue at a faster rate so overall there is a net positive on your performance on race day. How you taper depends on what you are racing. It seems that many people either don’t taper long enough or they taper too much and avoid any type of speed work the last week and that negatively impacts their performance. I rely on my Training Stress Balance as reported by Training Peaks, although Strava also provides a fitness, fatigue and form chart for premium members. When you are running, Pace is an easy way to judge your fitness but on a bike there are many other factors that influence speed to use that as a measurement. That is where a power meter really helps. Using a power meter, I can see that my peak power for different time intervals has improved considerably. This is the graph as of today. The grey graph is my best of the last two years and the purple is the last 90 days. I am not quite up to the level I was in 2013, but I am getting close. About 1/3 of the difference is that I was using a different power meter then that reads about 10 watts higher. The other 10 to 20 watts is due less fitness than in 2013 when I was doing hard riding in California before moving to Utah. Those power measurements from 2013 were when I was two years younger. 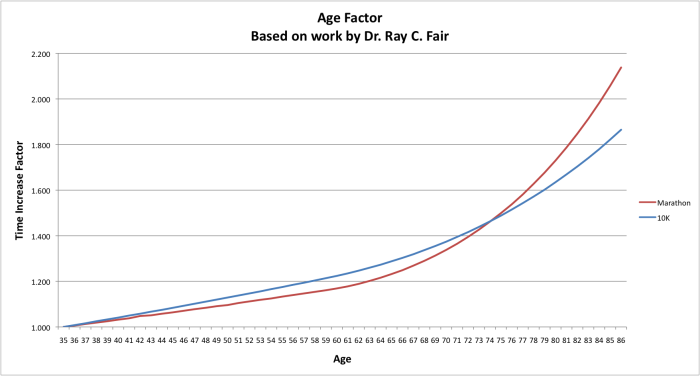 There is interesting study by Dr. Fair on the effective of aging on athletic performance. It turns out most people think they decline more than they need to and therefore back off and reduce their training. 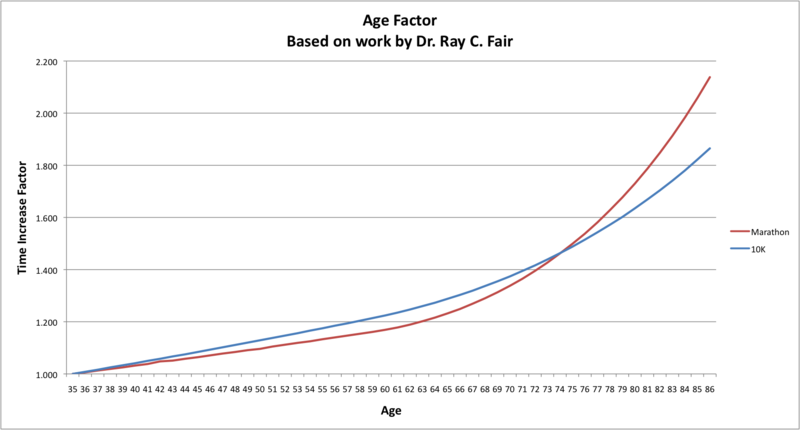 Still after age 60.5, the slope does increase but from 65 to 67, the reduction is less than 3% for world class athletes, as measured by race time. Although this study measured running at the 10K and marathon level, it likely applies to cycling also. So even if my power levels are not up as high as I was hoping, I am encouraged that I was able to set a new PR on a couple of Strava segments this past week, including the climb up Snow Canyon and the 15.4 mile segment from the Utah Hill intersection to Veyo. For the long segment I finally did it under one hour and reached to 4th overall for 65+ on Strava. Since this is part of the Huntsmen Senior Games road race, I recognize many of the names on that 65+ leader-board. Doing well on this long segment gave me a bit more confidence for racing Lotoja where I will be racing continuously for 90 miles with most all of the climbing of the 200 miles course. I realize I am not in the same condition I was 3 years ago when I raced the Hoodoo 500 on a relay team but I feel good, especially since I was finally able to get my weight down below 140 lbs, even with 2 weeks of heavy Italian eating. With 4 days to race day, there is little I can do for training other than managing the tapering phase to get the best balance between fitness and fatigue.